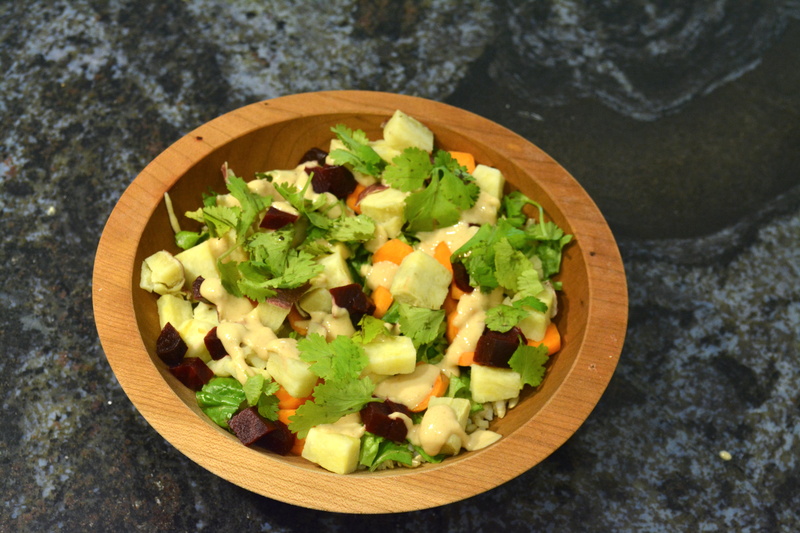 This delicious Buddha Bowl is very flavorful, filling and highly nutritious. My husband and I love it after a work out or a race. It is rich in antioxidants and phytonutrients and all of the anti inflammatory plant foods in the bowl help to quicken recovery rates between workouts. This allows for harder training. Don’t be fooled by this athletic sounding lingo, though. I’m not much of an athlete- but my husband is- and I’ve learned from him. I did, however, compete in my first Triathalon recently and I won!!! Not literally, of course, but a personal win nonetheless. You can read about it here. 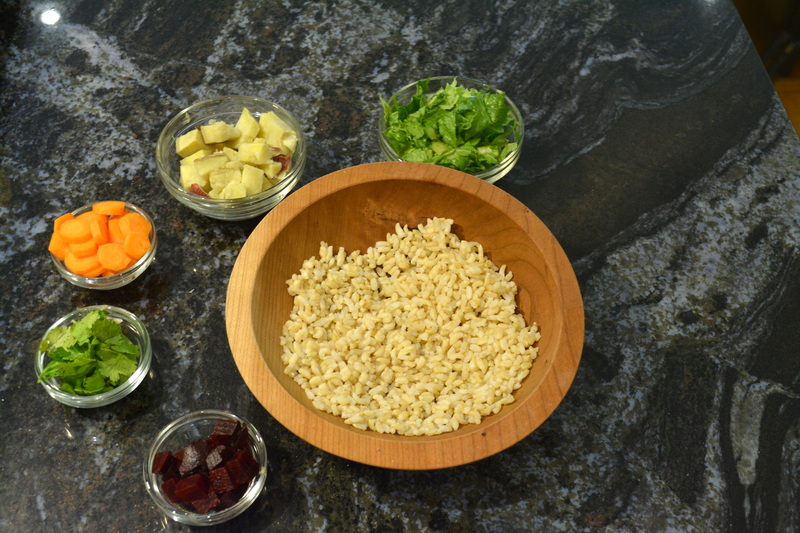 Brown Rice – make a batch and keep some in the fridge and some in the freezer. Use it for salads, stir fries, curries and burgers. Beets, Carrots and Sweet Potatoes – wash, peel, dice, chop and cook (if needed) your vegetables ahead of time and in large batches. Use some now and store some for later. If you have prepped veggies on hand, you are more apt to eat them. Greens- wash, dry and chop kale, romaine, arugula and collard greens. They will keep in an airtight container for days. This takes the chore out of prepping your greens when you are hungry and/or in a rush and will allow you to create meals in minutes. This salad, is wonderful paired with my Tangy Tahini Sauce. It offers a nice balance with the sweet flavors of the beets and sweet potatoes. My husband and I love this Buddha bowl after training or a race. It is rich in antioxidants and phytonutrients and all of the anti inflammatory plant foods help to quicken recovery rates. 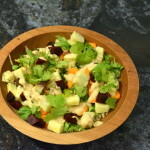 In a medium bowl add the brown rice, romaine, sweet potato, beets and carrots. Heat in microwave until just warmed. Time will vary depending on the power of your microwave. 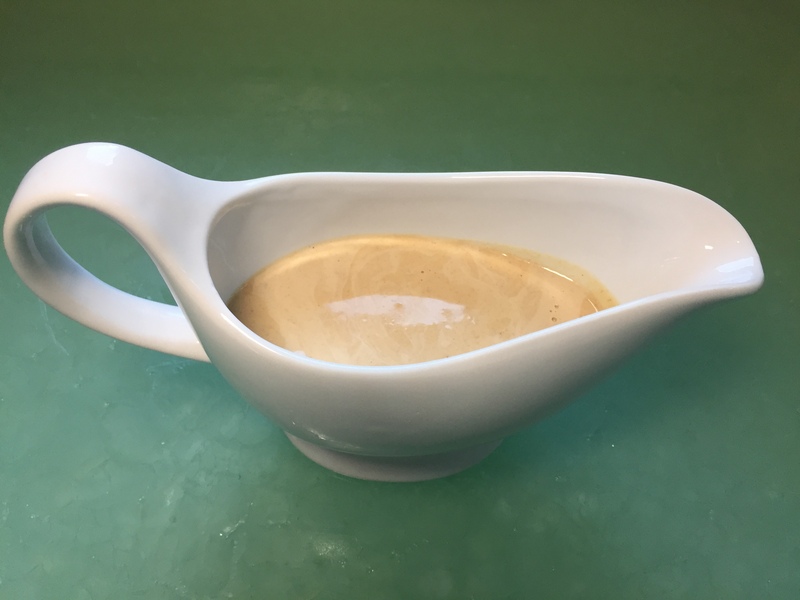 Dress with the Tahini Sauce. Garnish with the cilantro along with some hot sauce to taste. Great recipes and clearly labeled, easy to follow plant based recipes! Love your videos! I went from a healthy, low fat, no sugar diet to vegan 5 months ago and LOVE all the new recipes that one I make! I started my journey with Dr.Esselstyn’s book on How to Prevent and Reverse Heart Disease and regularly watch Ann and Jane Esselstyn as well as Chef AJ. I’m always looking for new and creative, and tasty recipes especially since I have a family of 5 with three growing kids that I cook for every day! Thanks for your great videos! That is wonderful Ruth. I am so happy that you are enjoying exploring vegan cuisine. I love the Esselstyns. Aren’t they doing a world of good? Anne and Jane are very entertaining and I love so many of their recipes. You can’t beat Jane’s 3-2-1 dressing. Just in case you haven’t yet come across it, 3 tbs balsamic vinegar, 2 tbs dijon mustard, 1 tbs maple syrup. Chef AJ is also great! Enjoy your journey and you’re family is very lucky to have you cooking for them! Thanks for writing!